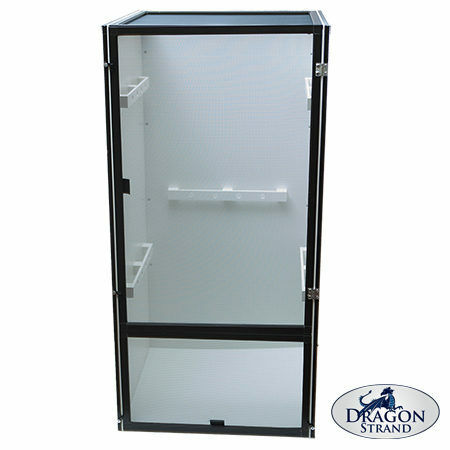 Dragon Strand cages are designed for the breeder or keeper who keeps multiple chameleons or other reptiles in the same room. Solid cage walls provide visual isolation, more effective lighting, and containment for your mist and watering. 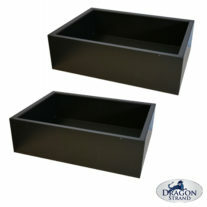 Keep the mist in the cage and off your room floor and walls! Propriety branch holders make it simple to branch your cage with wood branches or artificial vines. 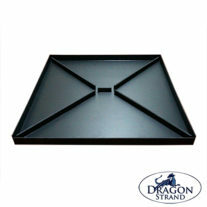 Removable cage bottoms are accessible through a trap door making daily cleaning easy with minimal disturbance to your chameleons. 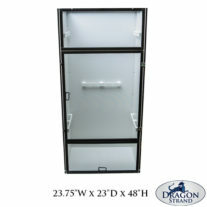 These cages fit a standard 18” deep rack making the most efficient use of your space. Quick cleaning: With a group to maintain, time is at a premium with cage cleaning. 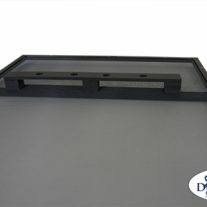 A trap door and removable PVC floor make both spot cleaning and deep cleaning of the floor a quick, easy, and non-intrusive event. Even an entire rack of 24 nursery cages can be cleaning in under ten minutes.